Humph! A very much delayed post…blame the lightning that snuffed out our computer and rendered it unserviceable for more than 3 weeks! Nevertheless, better late than never, yes? Lovely unexpected addition to our garden! 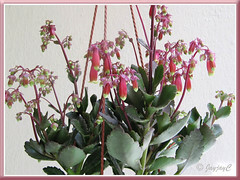 We walked into a nursery mid-March, hoping to get a pot of Christmas Kalanchoe blossfeldiana at a lesser price after the Chinese New Year festive season but there weren’t any to be seen. A blessing in disguise as there was another more catchy Kalanchoe variety which we’ve never seen before and it was an instant hit with us. 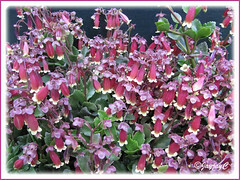 Kalanchoe ‘Wendy’ is its name, I think, after having google-searched its identity. A pot of this showy succulent with numerous clusters of hanging, bell-shaped rose-pink flowers costs only RM8.00, pretty cheap, huh! 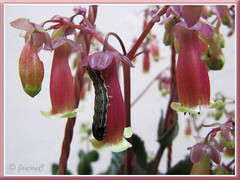 The best part is their beautiful flowers will last between 4-6 weeks and I read that Kalanchoe can be easily propagated. Yippee, value for money…I’ve just experimented with leaf cuttings this morning and hope to get more plants! Will try to propagate by tip cuttings when I deadhead our plant eventually. What a marvelous March surprise! 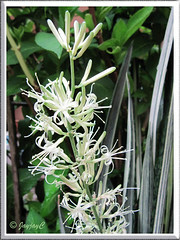 After a long lapse in flowering for 2 whole years, our White Sansevieria finally decided to treat us again. 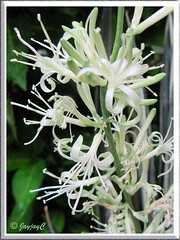 It is known to flower very rarely, hence we’re thankful to be able to enjoy its beautiful pearly-white and sweetly fragrant blooms on a 27-inch upright stalk for about 2 weeks. 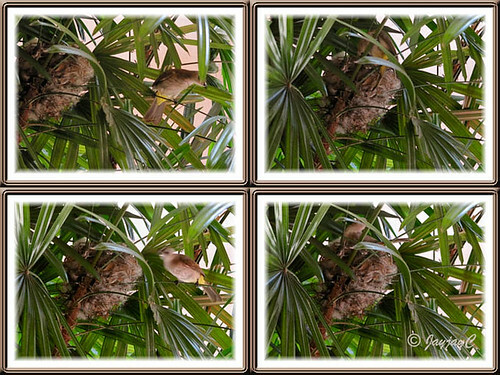 My darling John and I were really excited when we saw a pair of lovers attempted to build their nest on our potted Lady Palm trees (Rhapis excelsa) at our garden porch in early March. We had hope to experience once again the joy of following the breeding event by the same bird species, Pycnonotus luteolus goiavier on the same potted plants nearly 2 years ago. First try in early March failed as the nest was wishy-washy, made from too much soft cotton wool and lacked binding twigs. It was abandoned after a few days. Then the birds returned about 2 weeks later on March 21st and attempted to repair the nest, working on it with determination for 2-3 days. Delighted to have capture some shots to show one of them surveying and testing its home. The couple was very noisy over their finished job, probably congratulating each other with lots of sweet birdie dialogue. Same noisy sounds continued over 1-2 days later, but subsequently, there was total silence and the birds weren’t sighted at all. Sad to see the nest abandoned the second time. Both, our joy and theirs, seemed so short-lived! 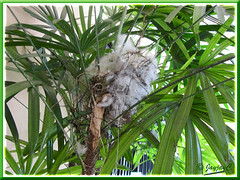 Upon checking, I observed that the nest was squashed. 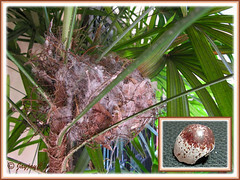 It was doomed to fail as the whole nest was held precariously at one side and attached to a single palm stem by just a few twigs, like holding a cup of tea with the little finger. Another failed attempt…poor dear young ones, so sad! 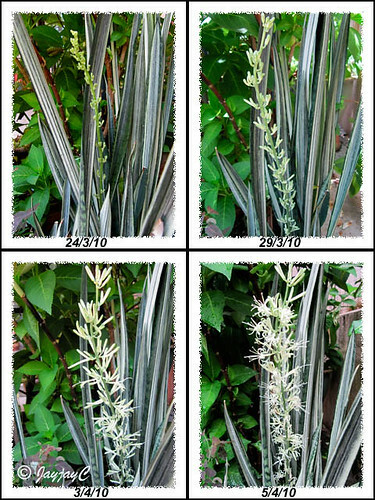 More grief followed 2 weeks later, when John discovered a piece of egg shell in a pot of Aglaonema (Chinese Evergreen) that was located below the palms. We deduced that the female bird did lay an egg after all but probably misfired, resulting in fallen and broken egg. It really broke our hearts as we can empathize with their loss, having suffered a miscarriage during my first pregnancy. Gosh, what sorrow! Nevertheless, we’re positive for this young couple. As I’m drafting this post, I can see them through our lace curtains, occasionally visiting the same potted Lady Palm trees which had been shifted to the corner of our porch recently. They sure seem resourceful! Wish you much success, sweet young ones!! 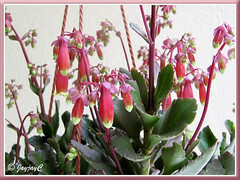 What a lovely Kalanchoe – those bell shape flowers are really amazing..
Its a pity to note that the birds unable to build a strong nest, hope it get again the next round & hopefully a family. Indeed, the bells are stunning, and as you’ve guessed it is a close-up shot of a caterpillar. Hehe…I just can’t resist sharing its beautifully patterned body here. Birds are half-way through nest-building again, almost 90% done as of today…hope the best for them this time! Thanks for dropping by and kind comments, James.